There are many examples of parasites altering the behaviour of their hosts, and some of them turn their hosts into functionally different animals compared with their uninfected counterparts. When this occurs in highly social animals, this effects can cascade onto other members of the group. Anomotaenia brevis is a tapeworm which happens to be one of many parasite species which have been documented to modify their host's appearance and/or behaviour in some way. While the adult tapeworm lives a pretty ordinary life in the gut of a woodpecker, the larva uses a worker ant as a place to grow and a vehicle to reach the bird host. Specifically, they infect Temnothorax nylanderi - a species of ant found in oak forests of western Europe. These ants nest in naturally occurring cavities in trees such as sticks or acorns and the colony consists of a single ant queen surrounded by several dozen worker ants. These ants are a regular part of the woodpecker's diet so there's a fairly reasonable chance that the tapeworm will reach its final destination if it waited around for long enough. But A. brevis is not content with just leaving it to chance. Worker ants can become infected through eating bird faeces which are contaminated with the parasite's eggs. 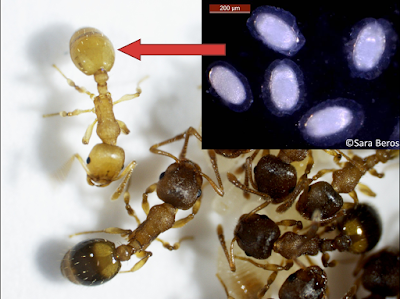 As the tapeworm larvae grow inside the ant's body, these infected worker ants become noticeably different from their uninfected counterpart; they smell different (determined by the layer of hydrocarbon chemicals on their cuticle), they're smaller, they have yellow (instead of brown) cuticles, spend most of their time sitting around in the nest, and for some reason their uninfected nestmates are more willing to dote on these tapeworm-infected ants rather than healthy ones. They essentially become a different animal to the healthy workers, and other ant parasites have been known to alter their host to such a degree that parasitised individuals were initially mistaken as belonging to an entirely different species. When scientists investigated the prevalence of A. brevis in nature, they found that about thirty percent of the ant colonies they came across have at least some infected workers. While in some nests only a few of the workers are infected, in other cases over half the workers are carrying tapeworms. Furthermore, they also found a few of the workers (2%) were infected but had yet to manifest the symptoms associated A. brevis. When over half the work force of a colony is under the spell of a body-snatching parasite, that must affect the colony in some way. So how does this affect the ant colony as a whole? During their development, infected ants have higher survival rate and far more of them (97.2%) reach adulthood compared with uninfected (56.3-69.5%) ants. This make sense from the perspective of the parasite's transmission as it needs its host to stay alive for as long as possible to get inside a woodpecker. But it seems to also affected their uninfected sisters because uninfected worker ants in a colony which has parasitised workers also have lower survival rates than those from colonies free of any tapeworm-infected ants. But A. brevis also affects the colony's functioning in other ways as well. The scientists behind the paper being featured today conducted a series of experiments where they manipulated the composition (and in doing so, parasite prevalence) of experimental ant colonies. Since T. nylanderi colonies regularly experience take-over and/or merging with other colonies, introducing or remove new ants into the experimental colonies would not cause them to exhibit unnatural behaviours as it is not too different what would usually occur in nature anyway. They set up colonies with different proportion of A. brevis-infected workers and tested how they responded to different types of disturbances. They simulated a woodpecker attack by cracking open the experimental ant nests and seeing how long it took for them to evacuate. Under a simulated attack, about half of the healthy worker escaped (48-58.9%) but very few of the tapeworm-infected workers escaped (3.2%), which is exactly what the tapeworm wants - remember, the parasite needs to be eaten by a woodpecker to complete its lifecycle - so when one comes knocking, the tapeworm gets it host to sit tight and prepared to be sacrificed. They also simulated intrusion from ants of a different colony or species by pitting individual invading ants against their experimental colonies. These invaders consisted of a mix of infected and uninfected individuals from nests which contained some or no infected nestmates. When confronting ants from other colonies, they were the most aggressive against the intruder if it was of a different species (in this case, T. affinis), but when it comes to other T. nylanderi ants, they responded more aggressively if the intruder from a different colony was harbouring tapeworm larvae. In contrast, they were pretty chill about the presence of tapeworm-infected ants if it was one of their own nestmate. But the tapeworm also affected colony aggression in another way - the research team noted that colonies with many infected workers were also less aggressive overall towards any invaders. Not only does A. brevis alter its host's appearance and behaviour, it also seem to cause the host's nestmates to be more chilled out. Parasites can manipulate their host in some astonishing ways, and the host's altered behaviour and/or appearance has been described as the parasite's "extended phenotype". But when the host is a social animal that is surrounded by many other group members, the parasite's influences can extend well beyond the body of its immediate host, and manifest in the surrounding kins and cohorts as well.